In this post we are going to take a look on how to add a reviewer to a Review Activity from Orchestrator. This is useful for occasions where you might want to add reviewers based upon the information specified in the parent Work Item. For instance, if a Change Request is related to a certain Business Service, you might want to add the owner of that Service as a reviewer for approving the actual Change Request. I know there are some blog posts out there that describe this as a small step of the actual post, but I feel like this topic deserves a dedicated post, so here we go. This might seem right, but it won’t work. Why? 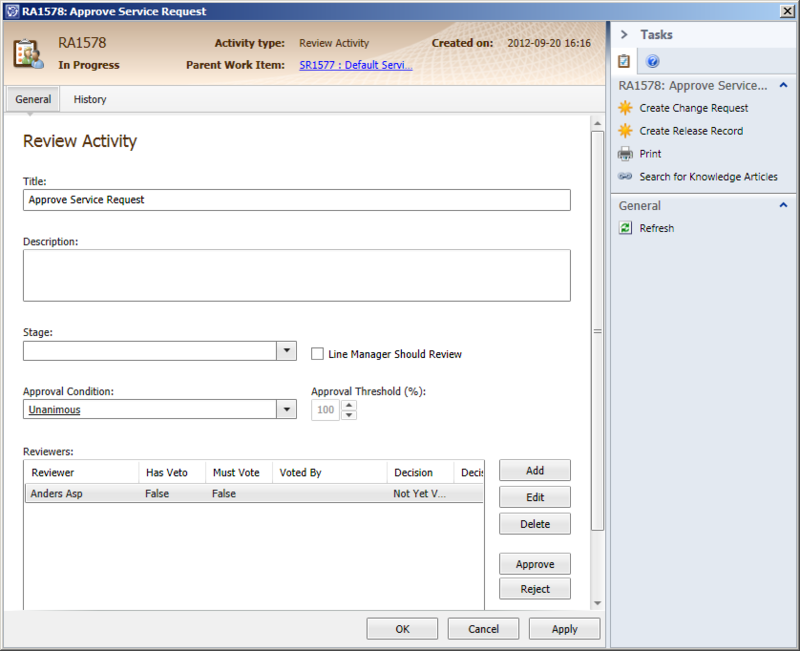 Let’s take a look inside Service Manager to figure it out. Here’s a picture of a Review Activity without any reviewers. 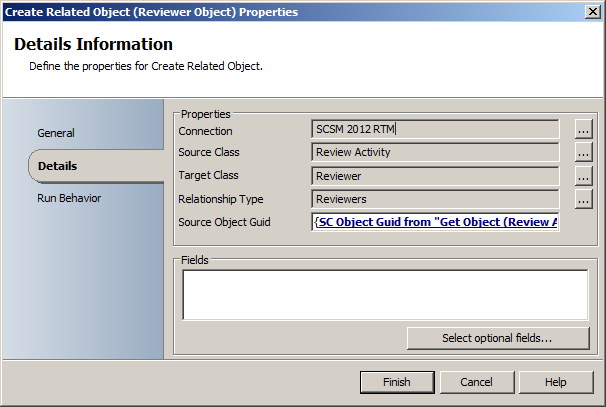 This is the object that we are retrieving in the “Get Object (Review Activity)” step in the runbook above. So let’s add a reviewer to this Review Activity by pressing Add. When doing so we are presented the following form. 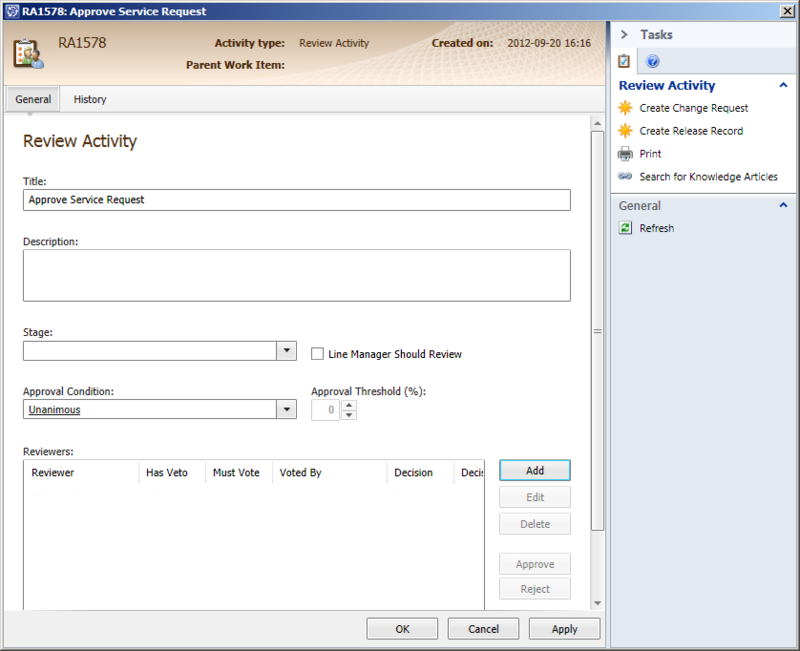 This is a form for a Reviewer object – and the reason to why the runbook displayed in the beginning of the post won’t work. You see, the Reviewer object is used to store properties such as “Has veto”, “Must Vote”, “Comment”, “Voted by” etc. We are actually adding a reviewing user to the Reviewer object, not the actual Review Activity. So with this knowledge, let’s head back to Orchestrator and make a new attempt to add a reviewer to our Review Activity. For simplicity I’m just retrieving a certain user – in reality you will most likely have this step much more dynamic, such as the user owning the related Business Service. Again, for simplicity of this demo I’m retrieving a specified Review Activity. Finally we add the relationship between the Reviewer Object and the Reviewing User. 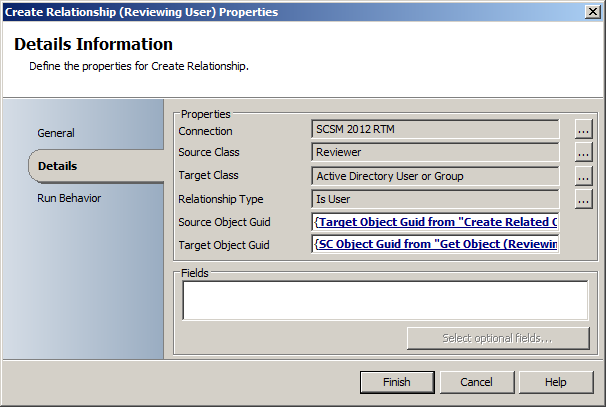 Note that we are using the “Target Object Guid” from the “Create Related Object (Reviewer Object)” step as the Source Object Guid! Great article. In some cases I may have the same person owning two business services that are associated with a change. Is there anyway to stop the same user being populated into the Review Item multiple times? I’d use some PowerShell / SMlets logics to do that Robert. 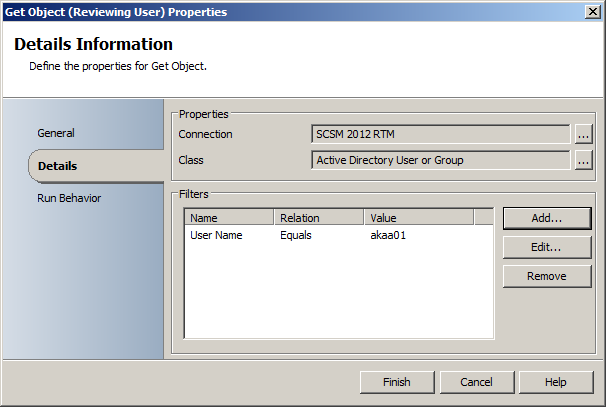 I continue to receive the Source Object Guid is Null or empty when it attempts to Create the Reviewer. Help? The blog above specifically is using GET OBJECT and filtering for the Review Activity by it’s ID. I bet Aaron and Erwin are using either Create Related Object or Get Related Object instead. — SC OBJECT GUID is the GUID of the relationship itself. So if you are going to reference your Review Activity’s GUID from Get Related Object or Create Related Object, you want to use TARGET OBJECT GUID, and not SC OBJECT GUID.